In 1979 Peter Cooney, a Montreal journalist, wrote a “lifestyles” piece for the Montreal Gazette on beer and pubs in England. You can read it here from the Google News Archive. (The Archive has plenty more on pub and beer history, for Britain and other nations). I was living in Montreal then and would have read this with morning coffee before driving to a downtown law office to beaver away at contracts and transactions. Parenthetically, I often used in my work the 1866 Civil Code of Lower Canada, a Civil Law inheritance of former French rule in Quebec. I have a vague recollection of having read this piece, it was the type of thing in the back of my mind that encouraged the first visits to Britain a few years later. I’d guess Cooney had read Michael Jackson’s The World Guide to Beer, out for two years by then, as parts of the article seem influenced by the book especially the history of the CAMRA beer lobby and development of the “Big Six” brewers. Cooney clearly had a sophisticated approach to beer, food, and travel in any case: there are no bad jokes about flat or warm beer, no gaucheries on undecipherable accents or uneatable food. Most important he was enthusiastic about genuine British beer. His remarks about CAMRA and a Canadian branch show how far its influence was spreading less than 10 years after its creation. Part of the matrix was being honest about Canadian beer. Cooney pulled no punches and said it more or less tasted all the same. The article is a template for the kind of beer journalism that later became legion: sophisticated, inquiring, indulgent of local customs. Jackson used a similar approach, pioneered it probably. Today, we take it for granted but not many years before, in a time of greater chauvinism, articles appeared that could be less appreciative of what seemed the parochial or the provincial in U.K. beer customs. Opening hours, beer type and quality, the lack of spirits availability (especially during wartime), and the absence of food were favourite talking points. The articles were often by Americans, but the writers of the former colonial countries could be more indulgent. How much of the U.K. pub world described by Cooney is still relevant? Well, a lot has changed. Restricted business hours are long gone. Food is not just more available and better than in 1979, this is the era of the gastro-pub – and London started it, in a pub still operating I hope to visit in August. Cooney described the early efforts at improving pub meals and the trend has only burgeoned in the last 40 years. As to beer, the range of flavours he discussed still exists as do some, but sadly not that many, of the 160 breweries then operating. While 160 is a tiny number compared to today’s, they brewed in most cases bitter, mild, and other traditional styles that today compete with craft (American) styles that were just getting going in 1979. The presence of imported draft beers in 2018 marks another difference, as does the growth in general of lager. The drink and driving issue he mentioned has long been settled. The smoking issue, still in gestation in 1979, also is just a memory. Finally, it comes down to the beer, the pub always does. 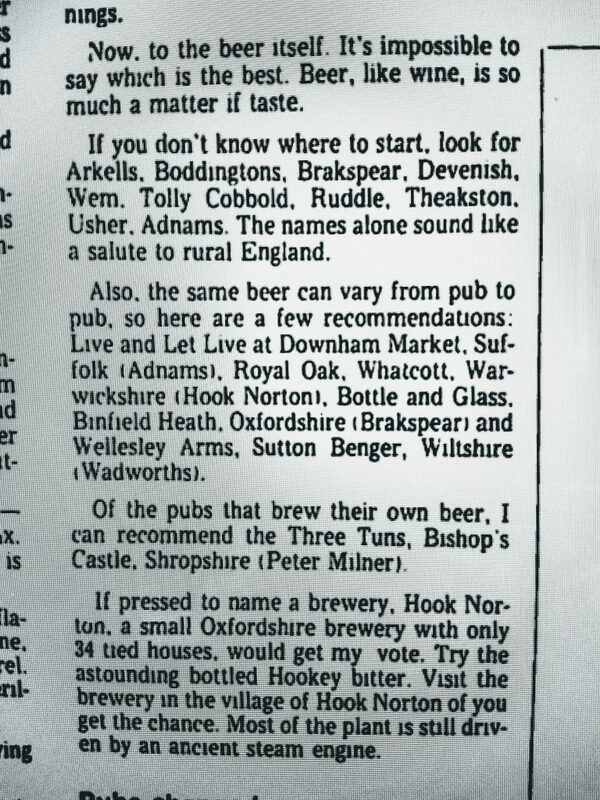 And Cooney showed he was a maven, or maven-in-training, in his particular appreciation of Hook Norton’s beer. The Oxfordshire brewery is among the royalty of surviving English breweries. Peter Cooney is still active in journalism and currently teaches part-time at Concordia University in Montreal. Note re quotation: the quotation above is from Peter Cooney’s 1979 article in the Montreal Gazette linked in the text. All intellectual property in the source belongs solely to its lawful owner. Quotation appears for educational and historical purposes. All feedback welcome. Legally, yes, but in practice many pubs actually open for shorter hours than they did in 1979, especially not opening at lunchtimes during the week. Plus many in rural areas don’t open on Mondays, which would have been virtually unheard of then. I thought the Royal Oak (I mentioned the pub on Twitter) was an interesting evolution from the time the journalist wrote in 1979 as it is clearly now a stylish gastro-pub. It must have been different in 1979 although quite possibly a fashionable pub, including for eating, then too. I have no issues with it, things must change over decades, and at least it is still open – when one considers that is that so many pubs have closed since those days. Great post, Gary! Makes me long to visit a rural English pub again. Curious: what London pub started the gastro boom? And one of the best chapters.